Cream Cheese Rosettes are elegant bite-sized candies that taste like sweet cream cheese with a light hint of lemon. These candies are easy to make, but require an extensive drying time, so prepare accordingly. I like eating these two days after they are made—the outside is set and somewhat crisp, and the inside is still soft and creamy. To get the rosette shape, you need to have a large star tip (commonly used in cake decorating) and a piping bag. I like to use the Wilton 1M tip, but any similar-sized star tip will work just fine. If you don’t have these tools, you can still make the candy and pipe it from the cut-off corner of a Ziploc bag, or roll it into patties, but it won’t have the beautiful rosette shape. In the large bowl of an electric mixer, beat the cream cheese until smooth and fluffy. Add 1 tablespoon of cream and the lemon extract and beat them in. Stop the mixer and add the powdered sugar. Mix on low speed until the powdered sugar is moistened, then turn to medium and mix until entirely smooth. Check the texture of the candy. It should be smooth enough to pipe easily, but quite stiff and able to hold a firm shape. If necessary, add another spoonful or two of cream, but try to add the minimum amount of liquid needed. 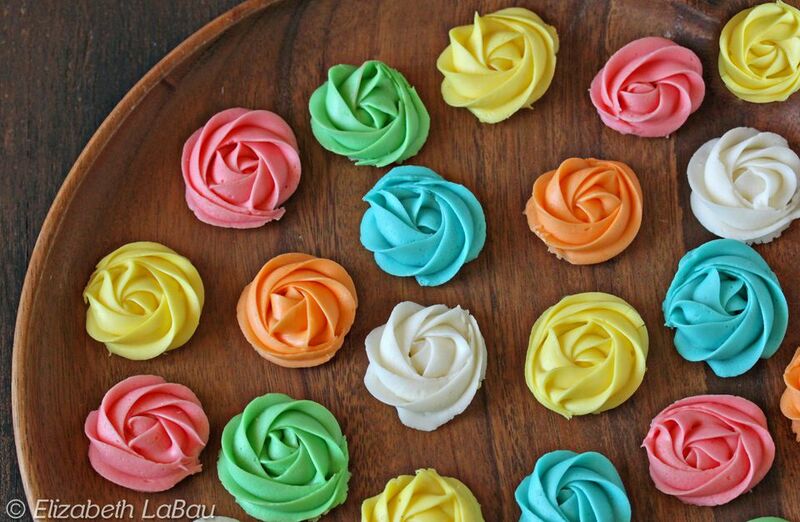 If you want different colored rosettes, divide the candy into separate bowls and stir in food coloring as desired. Fit a piping bag with a large star tip and fill the piping bag with the cream cheese candy. Hold the pastry bag perpendicular to the surface of the sheet, about 1/4” above the surface. Using slow and gentle pressure, squeeze the bag so that the candy starts to emerge. As it comes out, move the bag in a small circle around the center, going around once or twice to form a rosette shape. To finish the rosette, stop squeezing the bag and quickly draw the tip up and away from the candy. Repeat with remaining candy, trying to make all of the rosettes approximately the same size. Allow the rosettes to dry uncovered, 8 hours or overnight. Once they are fairly hard, use a spatula to move them onto a wire drying rack so that the bottoms can dry out. This will take another 6-8 hours, or overnight. Store the rosettes in an airtight plastic container between rows of waxed paper.